In a landscape of heavy, thought-provoking theater, sometimes all we need is theater that will entertain. The recipe to make an audience smile is a sprinkling of well-known standards, a dash of musical comedy, and a heavy layer of flashy dancing. The Roundabout Theater Company's production of Holiday Inn, inspired by the film of the same name, is an instant classic. If you're expecting perfection, this is not your show. Holiday Inn is all about the fun. 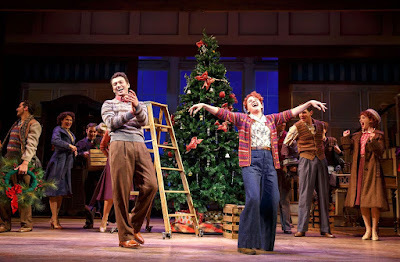 Written by Gordon Greenberg and Chad Hodge with music by Irving Berlin, Holiday Inn is a story about Jim Hardy, an entertainer who seeks a simple life away from the stage in favor of a Green Acres life after buying a farm in Connecticut. While his best friend Ted Hanover and fiancé Lila Dixon take their act on the road for a life of fame and new romances, Jim becomes smitten with the daughter of the farm's former owner, Linda Mason. With iconic numbers including, “Blue Skies,” “Easter Parade”, and “White Christmas,” Holiday Inn is classic musical comedy romance that brings two acts of cheer. Even as a formulaic musical comedy, Holiday Inn fulfills the smile quota. No doubt about it, Holiday Inn is a flashy Broadway musical. Every element Gordon Greenberg and company threw in fits the necessities of a big budget musical. There was nothing simple about it. The rural farm life extended beyond the proscenium, into the house where the boxes were lined with lattice and lanterns. As big and bold as the set from Anna Louizos was, a giant dramaturgical question arose. A main part of the plot featured Jim trying to save Mason Farm by opening the house up to guests on the holidays. Needless to say, Jim didn't have much remove of any money. Yet the decor that they use likely cost a pretty penny. Pretty to look at? Yes. Logical? Not at all. Alejo Vietti's costumes glistened and glittered. The choreography from Denis Jones was sugary goodness. With a plethora of tap-filled show stoppers, each of Jones’ numbers continued to top the one before. If your heart wasn't full and your eyes widen, you're clearly not in the holiday spirit. Taking on the Bing Crosby role, Bryce Pinkham is a magnificent leading man. Pinkham’s charisma carried the show. Opposite Pinkham, Lora Lee Gayer is delightful. She brought a modern comedic sensibility to Linda Mason that was nothing short of refreshing. As the loyal and faithful mistress of the farm, Louise, Megan Lawrence and her one-liners filled the room with laughter. But no one brought the house down quite like the littlest scene-stealer Morgan Gao. As Charlie Winslow, Gao was a natural. Broadway always needs a show that will do nothing short of entertain. Holiday Inn is that show this season. If you need an escape from the world, check into Holiday Inn.